Constant communal violence over the past five years has had a heavy toll on minorities in certain areas of India. Muslims make up the large majority of victims of hate crimes, threats, attacks on places of worship, and forced conversion, but Christians and Sikhs are also affected, says a new report. According to the report, A Narrowing Space: Violence and Discrimination Against India’s Religious Minorities, by the Centre for Study of Society and Secularism (CSSS) and Minority Rights Group International (MRG), unless efforts are advanced to address impunity and rising intolerance the situation will further deteriorate. The report is accompanied by an online interactive map Mapping Communal Violence in India 2013-2016, which depicts levels of communal violence across India based on official statistics. ‘While communal violence has long been a concern for India’s religious minorities, the current situation is particularly severe,’ says Claire Thomas, MRG’s Deputy Director. In recent years there has been rising hostility towards India’s religious minorities, particularly since the right-wing Bharatiya Janata Party (BJP) government, led by Narendra Modi, took power in May 2014 and began to actively promote Hindu nationalism. The report says that Modi’s reluctance to condemn these attacks is also reflected in more stringent laws that discriminate against religious minorities. ‘The passage of legislation which contributes to the targeting of minorities, such as more stringent anti-cow slaughter laws, combined with long-standing social, economic, and cultural discrimination, has left India’s religious minorities feeling increasingly insecure, and is particularly the case for those suffering multiple discrimination, such as women and low-caste communities,’ adds Thomas. In this environment, extremist right-wing groups have been emboldened to escalate attacks against religious minorities, including vigilante ‘cow protection’ groups and those involved with ‘anti-love jihad’ campaigns, both of which have become increasingly prominent since 2015. Perpetrators have been further aided by the problem of official indifference and even complicity in these attacks, say MRG and CSSS. Unless the generalised climate of impunity is urgently addressed, attacks against religious minorities are likely to continue. MRG and CSSS urge the Indian government to enforce existing legislation protecting the rights of all religious communities, with the full commitment of police, judiciary and other actors. The BJP’s promotion of Hindu nationalism is not only exclusionary towards India’s minorities, but has contributed to an overall atmosphere of intolerance in India, say the rights organisations. ‘High-level government officials have made statements that are spiteful to minorities, which has in turn motivated Hindu nationalists to indulge in violence on the streets,’ says Irfan Engineer, Director of CSSS. ‘For instance, the Minister of Women and Child Welfare stated that profits from slaughter houses are being used to fund terrorism. Not only was this an out of turn remark; it also encouraged vigilantes to attack members of minority communities engaged in the cattle trade,’ he added. The report, and the interactive map launched alongside it, says that communal violence remains primarily concentrated in certain states, with the highest levels in Uttar Pradesh. Since recent elections in the state in early 2017 won by the BJP, there has been a spate of anti-Muslim violence, including reports of Muslims families fleeing their homes to other areas of Uttar Pradesh on account of rising threats and violence. It also warns that levels of communal and anti-minority violence are likely to be considerably higher than reflected in official figures, as many incidents go unreported by both the Indian authorities and the media. 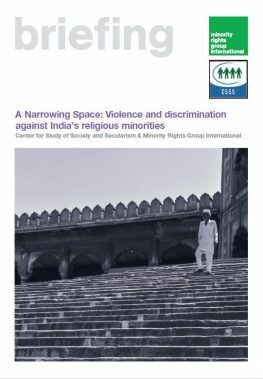 The report, Narrowing Space: Violence and Discrimination Against India’s Religious Minorities, is available for free download on MRG’s publications website. It focuses on the period between 2011 and 2016 and analyses key trends in communal violence and their implications for the country’s religious minorities. Developed by the Centre for Study of Society and Secularism and Minority Rights Group International, it references the latest available data provided by the Ministry of Home Affairs and the National Crime Research Bureau, as well as media and fact-finding reports. The online interactive map Mapping Communal Violence in India 2013-2016 includes disaggregated statistics by state – number of incidents, and related deaths and casualties per year – as well as information regarding demography and relevant legislation, the map provides a visual representation of recent trends and developments, with figures spanning two different national governments.